Introduction: The health planners in India have visualized primary health centers (PHCs) and community health centers (CHCs) as the key healthcare delivery institutions in rural areas. These centers are supposed to have health manpower, infrastructure, and service delivery as per the Indian public health standards (IPHS) guidelines (2010). 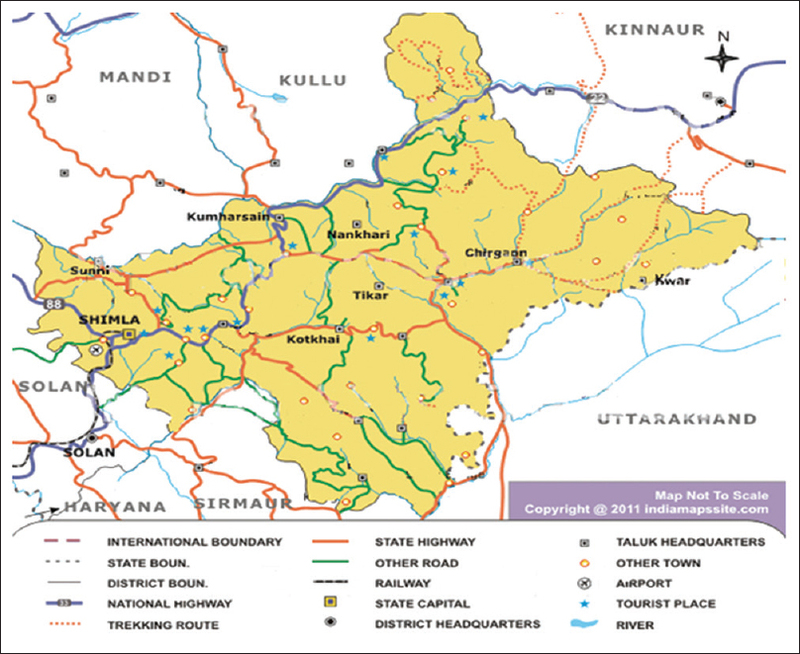 Materials and Methods: A cross-sectional study was conducted in seven CHCs and 12 PHCs, randomly selected from eight blocks of Shimla District and evaluated in terms of health manpower, infrastructure, and services from September 2011 to August 2012. Data was collected from the selected units using structured data collection instruments designed by the IPHS. Results: The health centers were assessed according to IPHS guidelines. Outpatient department services and referral services were provided in all the centers studied. No specialist doctor was posted at any of CHCs against a sanctioned strength of at least four (surgeon, physician, obstetrician, and pediatrician) per CHC. In 3 (42.8%) CHCs and 8 (75%) PHCs, no pharmacist was posted. Eight (75%) PHCs did not have any staff nurse posted. Three (42.8%) CHCs and 10 (83.3%) PHCs did not have a laboratory technician. In CHCs, separate labor room was available in 6 (85.7%) whereas a separate laboratory was available in all seven. Separate labor room and laboratory were available in four (25%) PHCs. Conclusions: IPHS guidelines are not being followed at PHC and CHC levels of the district. Health manpower shortage is the key bottleneck in service delivery. Political advocacy is needed to ensure sufficient health manpower availability to deliver quality healthcare. Standards are a means of describing the level of quality that health-care organizations are expected to meet or aspire to. Key aim of these standards is to underpin the delivery of quality services which are fair and responsive to client's needs, which should be provided equitably and which deliver improvements in the health and well-being of the population. Standards are the main driver for continuous improvements in quality. One of the core strategies of NRHM is strengthening existing PHCs and CHCs for improved curative care to a normative standard (Indian public health standards [IPHS] defining personnel, equipment, and management standards)., The IPHS have been recommended to ensure the quality of care in rural India since the launch of NRHM. Very few studies have been carried out to see the progress in the implementation of these standards in CHCs and PHCs. Keeping this in mind, a study was planned in Shimla district to assess the status of PHCs and CHCs as per the IPHS in the state of Himachal Pradesh. A cross-sectional study was conducted in the CHCs and PHCs of Shimla district. The study comprised cross-sectional survey of the services, manpower, infrastructure, and utilization of services in CHCs and PHCs of Shimla District. This study was conducted in seven CHCs and 12 PHCs of Shimla District from September 2011 to August 2012 [Figure 1]. There are eight health blocks in Shimla District which have seven CHCs and 76 PHCs. All seven CHCs in Shimla District were included in the study. PHCs in Shimla District were divided into two groups – easily accessible area and difficult area, in consultation with Medical Officer Health (MOH), District Shimla, and the Block Medical Officers of the respective CHCs included in the study. One PHC under each CHC was selected randomly from each group, in order to have a geographically representative sample from the district. In total, 12 PHCs were selected as one of the CHCs, i.e. CHC Dodra Kwar did not have any PHCs under it. Structured standard IPHS facility survey format for PHC. The purpose of this study was discussed with the Chief Medical Officer (CMO) and MOH, Shimla. After seeking their permission, the study protocol was explained to all the Block Medical Officers of Shimla District along with the CMO and MOH, Shimla, in their monthly meeting. Then the CHCs and PHCs were visited after taking prior appointment from the in charge of the center. The data collection was done in two stages. Stage one of data collection comprised a visit to the CHCs, and the second stage comprised a visit to the PHCs. Data were collected by interviewing service providers through a structured questionnaire developed by referring the IPHS for PHCs and CHCs and also record review was done at PHCs and CHCs. It includes services, manpower, physical infrastructure, equipment, drugs, furniture, and quality control. The data so collected was entered into MS excel sheets and analyzed using standard statistical techniques. Descriptive statistics were used to analyze the data. Qualitative data was measured in frequency and proportions. The study was approved by the Ethical Committee before starting the actual study. General duty Medical Officer, nurse and class IV were present in all the CHCs. Out of seven, 3 (43%) CHCs were without a pharmacist, 3 (43%) CHCs were without a laboratory technician, 3 (43%) CHCs were without an ophthalmic assistant, and 4 (57%) CHCs were without a radiographer. The other recommended staff was not there in most of the CHCs [Table 1]. Major shortcoming was that there was no specialist of any specialty present in any of the seven CHCs of Shimla District. The number of doctors, nurses, and pharmacists was less than the recommended IPHS norm. General duty Medical Officer and class IV were present in all the PHCs. Out of 12 PHCs, 3 (25%) PHCs had a pharmacist, 3 (25%) PHCs had a staff nurse, 2 (16%) PHCs had a laboratory technician, 2 (16%) PHCs had a clerk and only 1 (8%) PHC had a health worker. The other recommended staff, i.e., health assistant, health educator, and the driver was not there in any of the 12 PHCs studied during the study period. The existing staff position in the 12 PHCs of Shimla district studied during the study period is listed in [Table 1]. The number was less than the recommended IPHS norm. Six CHCs (85%) had a designated government building and one CHC was located in a government building not designated for the CHC. Eight PHCs (66.7%) had a designated government building, two PHCs (16.6%) were located in some other government building, and 2 PHCs (16.6%) were located in rented premises. The study revealed that well-designed Laboratory room and equipments are present in all the seven CHCs (100%), but it was functional in only five CHCs (71%). Laboratory is there in four PHCs (33.3%) but it is functional in only two PHCs (16.7%). Operation theater (OT) was present in three CHCs (43%) but the equipments for OT were present in only one CHC (14.3%), surgeries were not conducted in any of the OTs. OT was also present in three PHCs (25%), but the equipment was not present and surgeries were not conducted in any of them. Labor room was present in six CHCs (85.7%), and deliveries were conducted in all six of the CHCs (100%). Labor room was present in four PHCs (33.3%), but deliveries were conducted in only one of the 12 PHCs (8.4%) studied [Table 2]. Waiting room for patients was present in five CHCs (71%) and six PHCs (50%). Inpatient beds were present in all the seven CHCs (100%) and six CHCs (85%) were also admitting patients. Beds were present in six PHCs (50%) but only three of them were admitting patients. Residential accommodation for the doctors and other staff was provided by six CHCs (85%) and two PHCs (16.7%) in the study. All the PHCs and CHCs in the study had access to electricity and piped water supply. However, telephones were available in only six CHCs (85%) and two PHCs (16.6%). The basic furniture such as chairs, tables, examination tables, stools, and waiting benches for patients were adequately present in all the CHCs and PHCs that were studied. 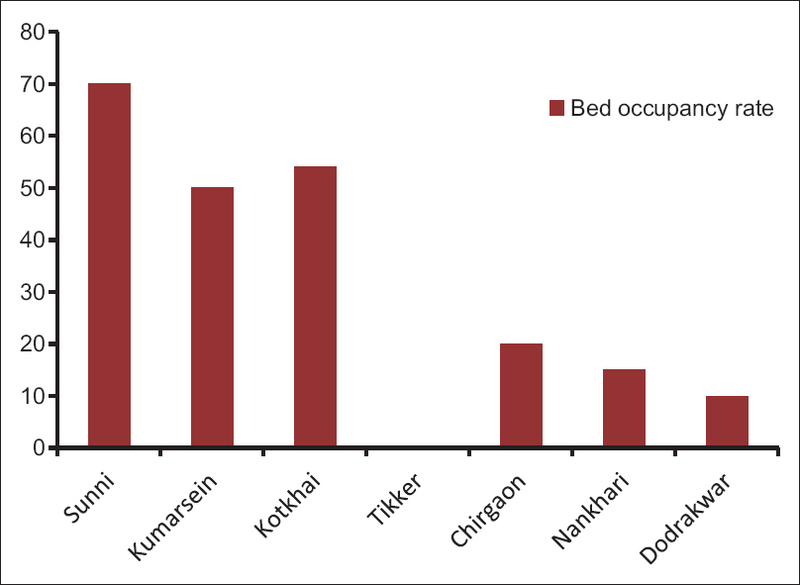 Bed occupancy rate in CHCs [Figure 2] in last 12 months as calculated on the day of the visit was >60% in CHC Sunni, 40–60% in CHC Kotkhai and CHC Kumarsain, and <40% in the other CHCs. Bed occupancy rate for all the PHCs was zero. The study shows that doctors are posted at all the CHCs and PHCs of the district Shimla, which were included in the study, but paramedical staff was deficient, more so in the PHCs. A study conducted in Gujarat showed that the post of Medical Officer was filled in 80% PHCs whereas in 20% PHCs the post was vacant. In a study conducted in Riyadh, Saudi Arabia (1996), it was found that the staff was 100% complete for physicians, nurses, and clerks only as per standard no for each center, which was similar to this study. Centers did not meet requirements from the Ministry of Health for technicians, pharmacists, health workers, social workers, and health inspectors. Findings of the Programme Evaluation Organization study stated that the adequacy of doctors against their sanctioned posts seems to be encouraging, as 75% of doctors are in a position in assisted PHCs, whereas 96% of them are found in a position in non-assisted PHCs. The focus of the government seems to be on posting doctors in the rural areas, but the paramedical staff is not being posted to the same extent. The absence of paramedical staff makes it very difficult for the doctors to work in rural areas and it also dents their morale as they do not have support. The focus should be on posting all kind of staff, i.e., laboratory technicians, health workers, health supervisors, staff nurses also along with the doctors in CHCs and PHCs. This will not only support the doctors but also will motivate them to work better. The absence of specialists at CHCs is a big drawback as this undermines the importance of the CHCs. This problem is the main reason hindering the upgrading of the CHCs. In Himachal Pradesh, specialists are posted at district hospitals, civil hospitals, and CHCs. A study conducted in subcenters, PHCs, and CHCs in different states revealed CHCs are usually manned by general physicians with basic qualifications. This was found to be as high as 92% in Madhya Pradesh. Another study conducted in CHCs of Rajasthan revealed that 75% of CHCs studied had a surgeon and obstetrician and 50% had a pediatrician, 25% had anesthetist, and 25% had public health program manager. This deficiency could be due to lack of incentives, good salaries, and facilities. As per IPHS recommendations, there should be one specialist each of medicine, surgery, obstetrics, and pediatrics at a CHC and an anesthetist and a public health program manager should also be there and an eye surgeon for every four CHCs., What is required is innovative thinking on part of the administrators to understand why specialists do not prefer to go to CHCs. The specialists posted at urban areas can be deputed at CHCs on a rotation basis for once/twice in a week. This would also not be too taxing on the specialists. In the study, residential accommodation for the doctors and other staff is provided by majority of the CHCs and only two PHCs. A report on the study conducted in subcenters, PHCs and CHCs revealed that residential accommodation for health staff at all levels seems to be a problem. It is either not available, or if available, it is not conducive for habitation or it is located in an isolated area. Residential facilities for staff (Medical Officers, pharmacists, and nurses) were lacking in a study conducted by Akhtar in Empowered Action Group (EAG) and non-EAG states. This could be due to the lack of capital investment for strengthening health services. Provision of proper accommodation will not only encourage the staff to stay at the center, but it would also be an important step for the provision of 24-hour emergency services. The provision of 24-h delivery services at PHCs is an important component under the IPHS. This can improve by posting the recommended paramedical staff along with the doctors at the PHCs. As Janani Suraksha Yojna has shown that provision of incentives to the patient has improved the institutional deliveries, incentives should also be given to the provider of delivery services. The study revealed that laboratory is present in all the seven CHCs but it was functional in only five CHCs. Laboratory is there in four PHCs but it is functional in only two PHCs. OT is present in three CHCs but the equipments for OT are present in only one CHC, surgeries are not conducted in any of the OTs. This could be due to lack of specialist/surgeon at CHCs level. OT is also present in three PHCs but equipment is not present and surgeries are not conducted in any of them. A report on the study conducted in subcenters, PHCs, and CHCs revealed that while half of the sampled PHCs have labor rooms and laboratory facilities, only one-third have OTs. In a critical review conducted by Ray in West Bengal, it was found that out of 10 CHCs studied there were separate OTs in eight CHCs. However, there was major shortage of equipments. This study clearly shows a mismatch between the infrastructure and the manpower, as most of the OTs and labor rooms are unused, as specialist doctors and other staff are not there. This mismatch between manpower and essential facilities is a matter of serious concern. This would require not only infrastructural strengthening but also adequate human resource support and well-developed service delivery protocols. Investment in primary health care could generate positive health that is likely to reduce the need for secondary and tertiary care facilities, reduce the cost of healthcare, and enhance health equity. To ensure the availability, adequacy, and functionality of health infrastructural facilities including the medical and paramedical staff in PHCs, there is an urgent need to emphasize the systemic mechanism of supervision, monitoring, and review of the functioning of primary health-care institutions. This will not only help improve the quality of health delivery system but also ensure optimum use of public resources. Another approach which can be tried on a pilot basis is outsourcing of primary health care in a particular area to an NGO. Karuna Trust, an NGO, manages 25 PHCs in Karnataka and 9 PHCs in Andhra Pradesh. The results have shown that this method of public–private partnership can be very useful in improving primary health care at rural level. World Health Organization Technical Report Series. 472;1971:3. Indian Public Health Standards for Primary Health Centres Guidelines. Directorate General of Health Services, Ministry of Health and Family Welfare, Government of India; 2006:3-4. Indian Public Health Standards for Primary Health Centres Guidelines (Revised). Directorate General of Health Services, Ministry of Health and Family Welfare, Government of India; 2010:4-5. Indian Public Health Standard (IPHS) for Community Health Centres Level. Draft Guidelines, Directorate General of Health Services, Ministry of Health and Family Welfare, Government of India; 2005:5-6. Indian Public Health Standard (IPHS) for Community Health Centres Level. Revised Draft Guidelines, Directorate General of Health Services, Ministry of Health and Family Welfare, Government of India;2010:9-10. Taneja DK. National rural health mission – A critical review. Indian J Public Health 2005;49:152-5. Dutta PK. Need of training for health professionals on national rural health mission. Indian J Public Health 2005;49:133-7. National Rural Health Mission 2005-2012. Mission Document, Ministry of Health and Family Welfare, Govt.of India; 2005:112-5. Sundararaman T, Jain K, Raman VR, Singh PD. National rural health mission – Hopes and fears. Concerns about targeted sterilisation, retreat of the state and privatisation. Indian J Public Health 2005;49:156-62. Agarwal S, Sangar K. Need for dedicated focus on urban health within national rural health mission. Indian J Public Health 2005;49:141-51. Shukla A. National rural health mission – Hope or disappointment? Indian J Public Health 2005;49:127-32. Banerji D. Politics of rural health in India. Indian J Public Health 2005;49:113-22. Shah R, Bhavsar BS, Nayak S, Goswami M. Availability of services and facilities at primary health centers in Gujarat. Natl J Community Med 2010;1:24-6. Mansour AA, al-Osimy M. A study of health centers in Saudi Arabia. Int J Nurs Stud 1996;33:309-15. Evaluation Study on Functioning of Primary Health Centres Assisted Under Social Safety Net Programme. Planning Commission, Govt. of India; 2001:109-10. Summary of the Report on Workforce Management Options and Infrastructure Rationalization of PHC, Planning Commission of India; 2004. Available from: http://www.planningcommission.nic.in/reports/peoreport/peoevalu/peo_NCAER.pdf. [Last accessed on 2011 Sep 09]. Sinha TP, Anamika, Bhoi S. Application of Indian Public health standard for evaluation of community health centers of Rajasthan, India. Prehosp Disaster Med 2011;26:126-9. Ray SK. National rural health mission: A critical review. Indian J Public Health 2005;49:171-4.